Regardless of the size of your home, it can easily come to pass that you find entertaining guests to become more cramped and uncomfortable than you would like. Crowding makes it more difficult for people to enjoy themselves, but homeowners are often at a loss on how to make more space available. Building a new addition is an option, but a very expensive one, and people often overlook a space that is available already – the basement. A skilled basement renovations company can turn this neglected and unattractive space into a sophisticated and special place to which people will gravitate. Basements are probably the most neglected places in the home, which is a real shame because most of them have great potential, especially if you want to install a wet bar. Installing a wet bar ‘upstairs’ can interfere with normal use of the kitchen, dining room, or living room, and if space is at a premium you definitely don’t want to restrict it further. The open floor plan of a basement will allow plenty of room for the counter, stools or chairs, sink, and small refrigerator. Some people even install a scaled down kitchen along with the bar for added convenience. A basement bar opens up numerous entertaining options such as get-togethers for sporting events, parties, and family reunions. The bar itself will add an exciting decorative touch to the area and make this a place that is warm and welcoming. The open arrangement of the basement, with the bar as the focal point, will allow for entertaining larger numbers of persons than might otherwise be possible. Good lighting is essential for a successful basement bar. Some basements have no windows at all, while others have very small ones situated high on the walls. Fortunately, there are numerous lighting options that can make the basement bar bright and inviting. Track lighting is one way to light up the basement, but recessed lighting, especially if the ceiling is low, will help to brighten up the whole area. For basements with adequate headroom, a combination of recessed lighting and suspended lamps will add both light and ambiance. The small, rectangular windows present in most basements can sometimes be enlarged to open up the bar area to more natural lighting. If you want more light, but are afraid of sacrificing privacy, have glass blocks installed, they are attractive and will provide all the privacy you require. For basements that have no windows, another possibility is the installation of a ‘pretend’ window. By backlighting this type of window, you can give the illusion of the outdoors. Most stairs leading to the basement are fairly horrible – steep and unfinished. A complete renovation of the stairway will undoubtedly have to be done, and in some cases, the stairs should be relocated entirely. The approach to stairs leading to the basement should be the same as taken for stairs leading from the first floor of the house to the second – attractive and safe balusters and carpet covered stairs should lead the way to your basement bar. One of the best things about installing a basement bar is that it’s great to combine it with an entertainment center. Once flooring, wall and ceiling treatments have been attended to, comfortable seating and television, sound, and other media equipment can make this the perfect adjunct to the bar. No longer will those watching a sporting event or film have to run upstairs for a refill, the bar will be right there, ready to serve them. The bar refrigerator can be stocked with plenty to eat and drink so no interruption of the fun will be necessary. 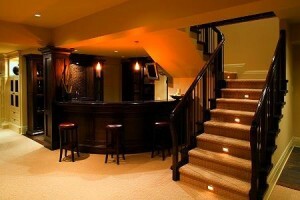 A basement bar can also be a central part of basement family room. The fridge can be stocked with fruit or soft drinks for the kids, and snacks can be kept in storage areas beneath the bar. Children will probably enjoy eating lunch at the bar, too. If the basement is large enough, a guest room can be situated in one corner. The sink and refrigerator at the wet bar will remove any need for an additional kitchenette for the guests and will give both hosts and guests a bit more privacy. Guests looking for a midnight snack needn’t worry about disturbing anyone in the house if a basement bar is available. We can install your basement bar in no time! Call us for free, no obligation estimate.